This is the bag I have been looking for for so long. I am limited to the use of only one arm so when I run errands to pick up small items, I toss them right in my bag. The quality is surpassed my expectations. The one thing I think that could improve this bag would be an outside pocket. I saw this bag online at the start of the year. I am happy to say I purchased it as a spring bag in the pale pink. It is beautifully made and has a soft color . Even though it’s pink-ish it’s almost neutral. I am very pleased with my bag! I bought this bag to use as my “luggage” for a weekend getaway to Montreal. It was the perfect size as it could easily fit two outfits and my toiletries case. It has such a chic look too! Will definitely be using this bag for future getaways. I absolutely love this bag. It’s super soft and just the right size for me. The pouch is definitely a plus as I use as my make up bag. I just purchased a black one also. Can’t wait for it to be delivered. The leather and workmanship were beautiful, but it was too large for my needs. Gorgeous. Beautiful soft leather. Perfect. Love my new bag, excellent quality, soft leather, fits all my needs. I love everything about the bag except for the fact that I got my initials monogrammed and it’s only on one side. So there’s an identical tab on the other side that is blank. I would have liked to been able to get both tabs monogrammed but that wasn’t an option during ordering. I feel compelled to write since I am over the moon about my purchase. 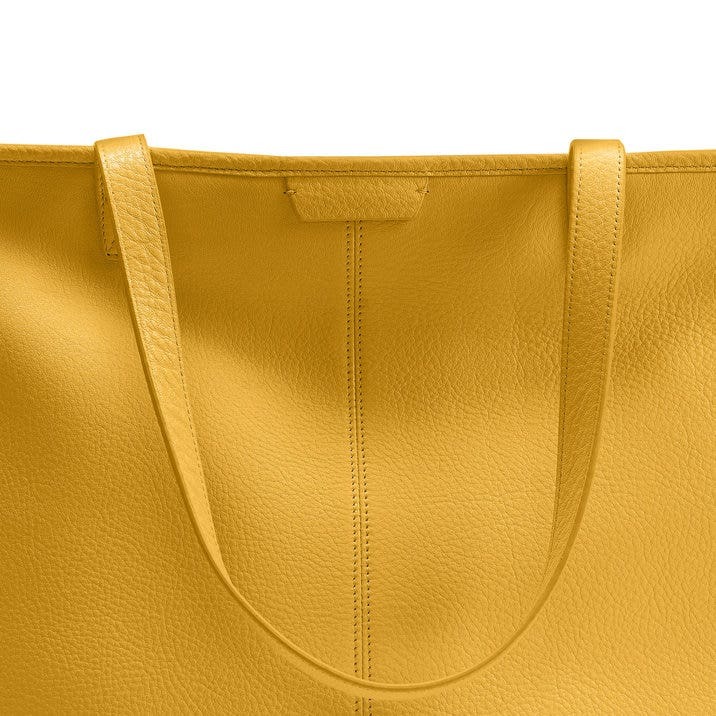 I looked at totes from various companies and actually checked one out in a store (Madewell), and ordered one that I ultimately returned (Everlane). Both were really nice, and of course this about personal preference, but where I liked the others, I LOVE this one! The leather is beautiful - thick enough, soft and supple, not too shiny or pebbled. Tons of inside pockets that are large enough to hold everything you need. Plus the leather pouch that attaches inside - I didn't realize that came with the bag. I carry my wallet, phone, cosmetics, 'lady products', sunblock, hairbrush, glasses case . pens and a selection of quality teabags - I'm English and your tea is not great! I Now everything has it's place, and I'm not scrambling at the check out to find my wallet or phone. I took a risk, having never heard of Leatherology, and really went off the quality of the customer reviews, so also feel it is my duty to steer all you lovely ladies in the right direction. Enjoy! !